Charleston Beer Week picks up new sponsors, breweries | Drink. Blog. Repeat. Participating breweries have slowly started to trickle out during the past couple of weeks. 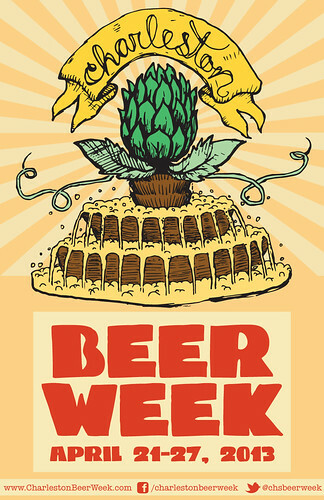 All five Charleston-based breweries – COAST, Holy City, Palmetto, Westbrook and Frothy Beard – will be participating. Elsewhere in South Carolina, River Dog, RJ Rockers and Thomas Creek are also involved. Other bigger national breweries will also be doing their part as well. You can see the full list of participating breweries here. Four new “Pitcher-level” sponsors were announced this morning. They are: The Alley, a retro-style bowling alley and beer/food destination; Craftsmen Kitchen & Tap House, a new craft beer-centric eatery that is currently teasing everyone in Charleston by being this close to opening; Smoky Oak Taproom; and Liberty Tap Room & Grill. You can find a complete list of sponsors here. The official poster for the week was unveiled yesterday. Developed by Colin Robinson – whose work you’ll recognize if you’ve ever seen a bottle of Westbrook – the poster will begin popping up around town shortly. You can check it out below. you know anything about The Alley? it sounds pretty awesome.